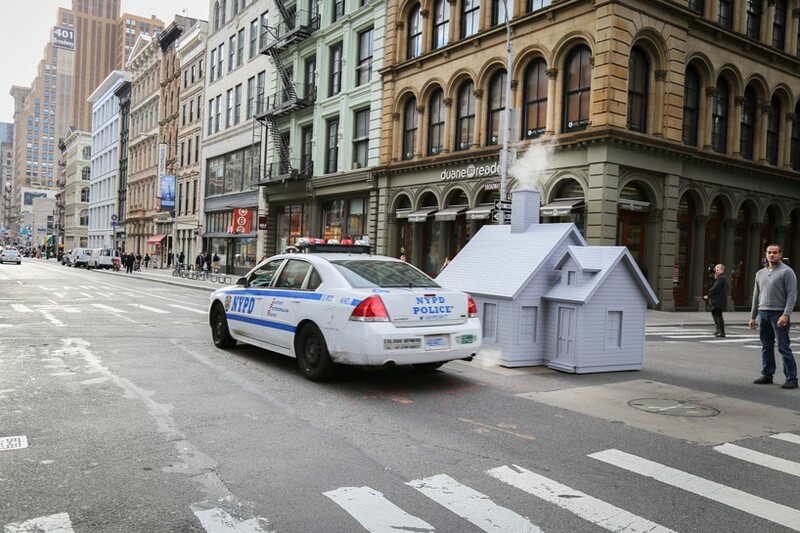 mark reigelman’s site-specific public works challenge typical urban settings and celebrate the human condition within the metropolitan landscape. through staged art interventions in public spaces, reigelman reorients the viewer’s perception and enhances collective consciousness. 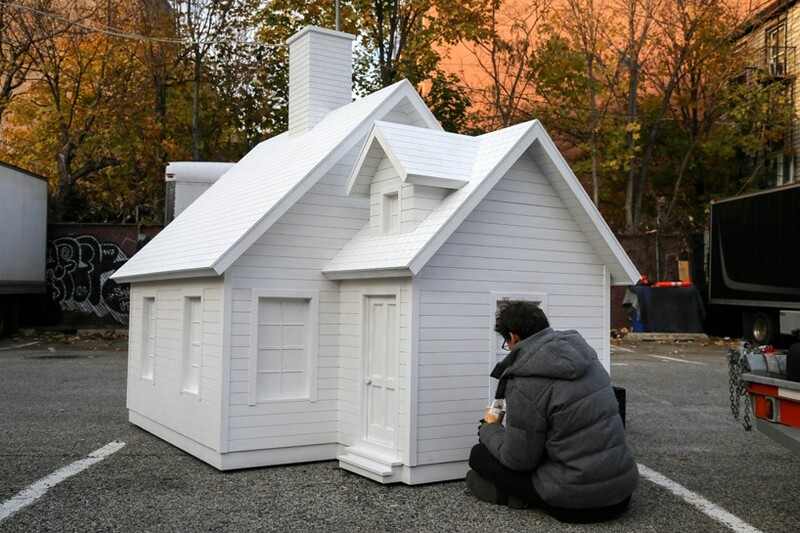 for his project ‘smökers’, the artist has created a miniature monochromatic wooden cabin, which was temporarily installed atop steaming manhole covers throughout new york city, replacing the brightly colored plastic steam tubes which are used to channel and release smoke. 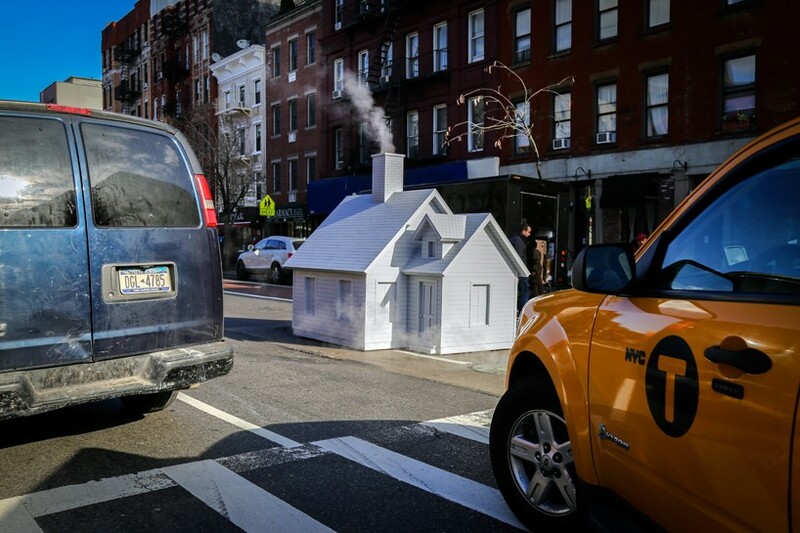 the plastic orange steam tubes placed above manholes in new york are a commonplace element within the urban landscape. these tubular chimneys offer some sense of spectacle and mystery, but for the most part are one more obstacle in traversing the city. 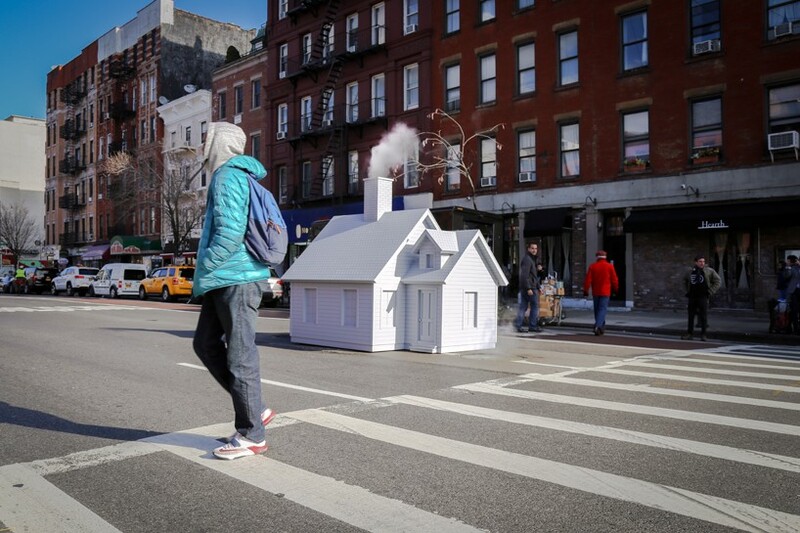 ‘smökers’ forces spectators to reconsider the framework of a city’s infrastructure, and readdress the functionality and activation of public space. the project draws upon reigelman’s childhood fascination and familiarity with small hand-made german objects ‘räuchermann’, which are commonly referred to as ‘smokers’. these are typically used as simple wooden incense burners, which often resemble cottages, animals, and chimney sweeps. the aesthetics of these common german items reference the orange and white candy-cane striping of these plastic steam tubes, but more importantly both have identical functionality and usage – to channel and release smoke – compounding the nuance of the work. with this concept in mind reigelman sought to imbricate the purpose of steam tubes, and insert the notion of whimsy and imagined narrative to the everyday. 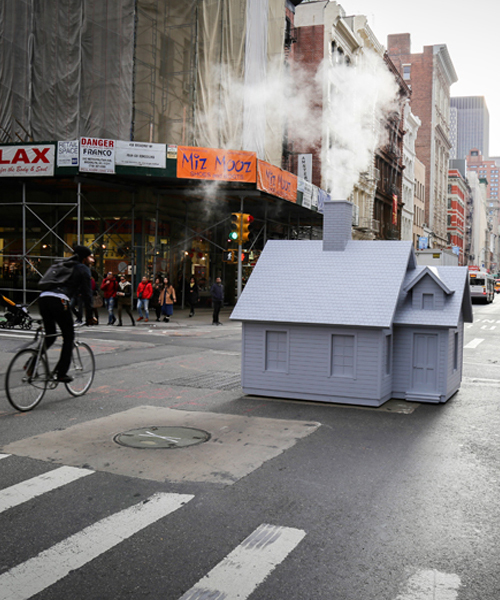 ‘smökers’ was fabricated in brooklyn, NY utilizing local manufacturers, suppliers and craftspeople. 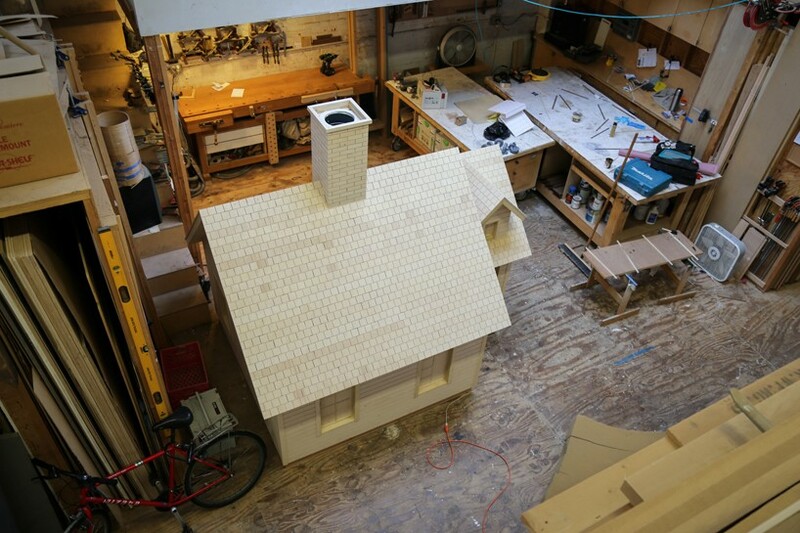 for the construction of the cabin reigelman collaborated with master carpenter andrin widmer. 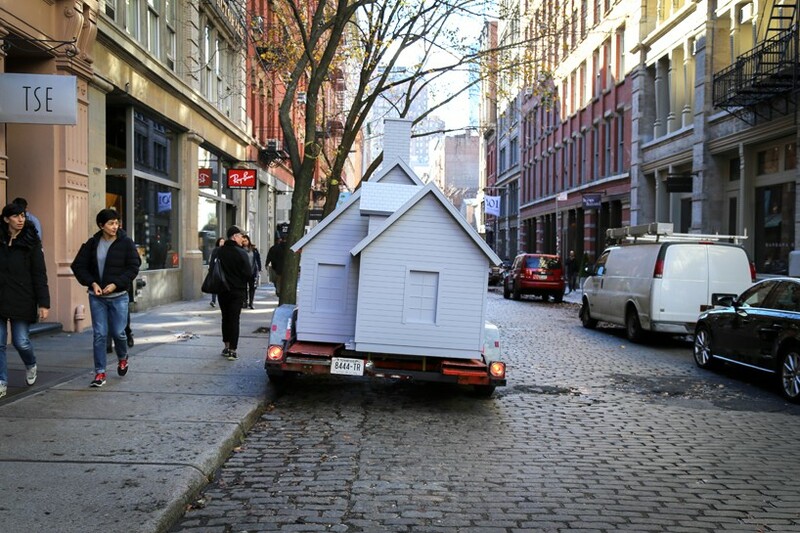 the entire structure hovered 1” above the ground on 4” industrial rubber casters which allowed the small house to glide effortlessly from location to location throughout manhattan. 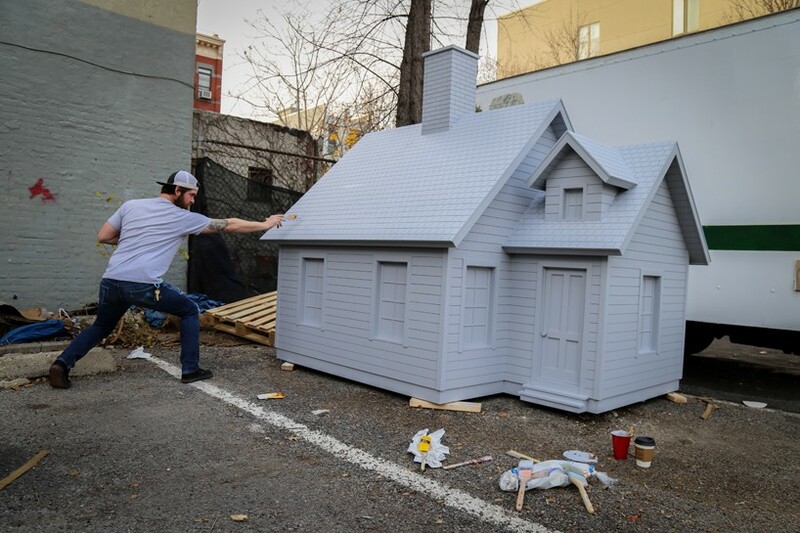 the entire constrcution was hand painted with an outdoor paint color titled ‘pigeon grey’, which further emphasized the notion of overlooked blips in the urban environment. 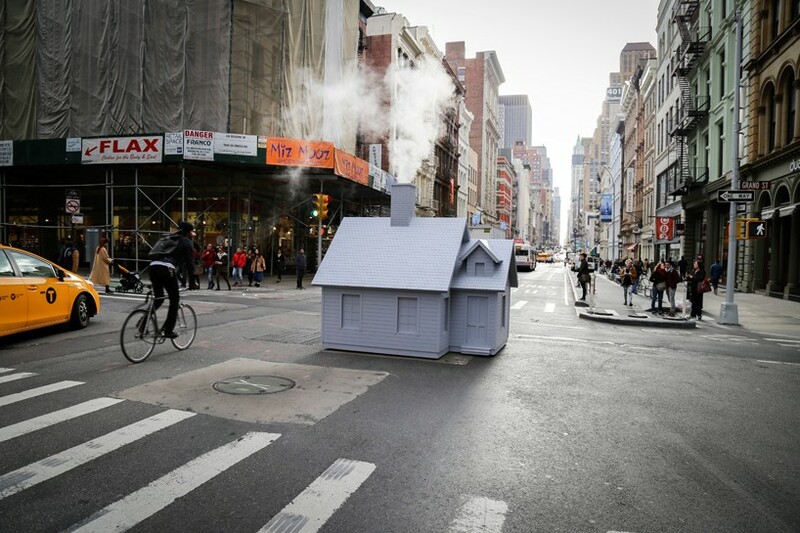 ‘smökers’ was installed in three central manhattan locations ; broadway ave. and grand st. (soho), 1st ave. and 12th st. (east village) and park ave. and 27th st. (midtown).